Businesses are very different, so our solutions are too. Providing a logistics solution for the UK governments National School Breakfast Program. Working with the Kuwaiti Cultural Office in Knightsbridge to create a HR management system. Magic Breakfast is an amazing charity that deals with malnourished children in inner city schools. They deliver free breakfast clubs to almost 300 schools across the UK. TechBank met Carmel and Alex at the TED London Conference. At the time they were running deliveries to all these schools using Excel sheets and paper forms, ringing round suppliers and schools to try and make the most of the resources that had available. After talking with Alex it became clear that a stock control system would only be helpful, however it would have to integrate into their current work flow. Where distributors, suppliers and school teachers all have inputs to make, (at the time by phone). While most companies can make use of TechBank's stock-control TechBrick almost straight out of the box, for Magic Breakfast we added an extra interface that simplified the work required by schools down to a simple button. Now TechBank software allows suppliers, distributors, schools and Magic Breakfast staff to log in and input information about orders, prices, class sizes etc. Though Magic Breakfast has grown a lot since it's inception the system is still a vital part of the charity and allows less time to be spent on Excel sheets and more time to be spent actually feeding children. We are not technically minded at all, and when we met TechBank 3 years ago there were only two of us working here! Since using the database stock control system we’ve grown to 8 staff and take breakfasts to 3 times as many schools. I don’t think we would have been able to grow at that rate if we were still having to manually fill in paper forms and chase every last detail over the phone. ChanJones Ltd is very proud of the fact that one of the first organisations to use our in-house Human Resources system was the Kuwaiti Cultural Office. 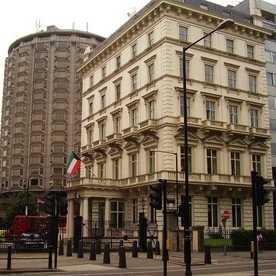 Located in Knightsbridge and connected to the embassy, the cultural office also deals with all the sponsorship and placing for Kuwaiti students at universities in the UK. Unlike the embassy, which maintains a fairly stable staff the cultural office was growing to fill the demand for a UK education. It had reached the point where they had been unable to cope and had a new system designed. In May 2014 they went live with our HR system solution. Installed by a ChanJones engineer after some slight alterations to allow seamless integration into the new KMS system. During the installation it was decided that the old digital punch card system could be greatly improved without too much effort so ChanJones built a new one (and this is now an optional feature in our HR software) No more extra work, and we even use the existing KMS user information so now the IT department only have to maintain one database. The HR system allows users to book holiday/sick days from any machine, records sign in and sign out times and had a fully extensible reporting tool that can create Excel sheets designed to fit with the workflow in the accounts department. This system means that when a staff member feels unwell they can book a sick day that morning. This can be authorised by management from anywhere on the globe (useful when your management move back and forth to Kuwait.) Managers can see at a glance who has holiday, which department is short staffed and who is going the extra mile. At present the Al-Burhan centre is storing records on paper and Excel sheets and transferring this information via periodic emailing. While the staff have been incredibly innovative to push this system to its capacity it is now starting to hold them back. In June we at ChanJones Ltd proposed that the current combination of Excel sheets and e-mails be replaced with relational database on a shared server. This means all information can be recorded in one place (though it will then be backed up to multiple servers) and can be accessed by all staff at all times. This will allow staff to concentrate on their core duties, improving the experience for everyone and saving costs. Improving the efficiency of the ABG Centre to a level where it will be able to cope with the planned expansion. ChanJones sent a representative over to Baghdad to analyse the current procedures before going ahead with any design work. The ABG Centre will be using various components however they are also looking for some custom solutions to some unique problems. This has been one of our most interesting (and at times difficult) projects. However we are confident that it will greatly improve the day to day experience of staff and guests at Baghdad International Airport. In the last few weeks we oversaw the installation of the first part of the new ABG System. A photographic ID validation system based on QR codes and some clever database interfaces. This system allows full secure recording of access without hindering the managers on the ground who may need staff and contractors on short notice.